The Alphabet Blocks Train encourages children to develop their letter recognition and counting skills by turning colorful rows of blocks. 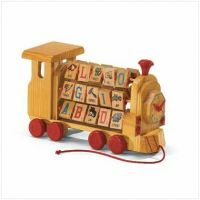 Letters and numbers with associated pictures and quantity assist toddlers in learning their ABCs and 123s while having fun with a rolling wooden choo-choo! Ages 2+.